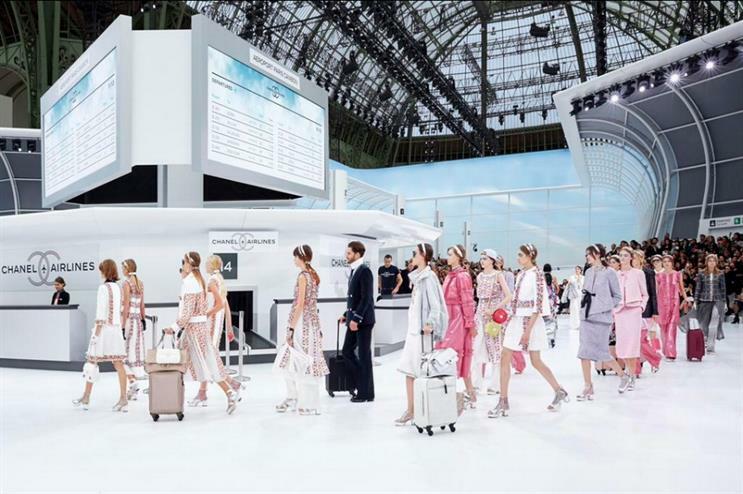 Chanel's creative director, Karl Lagerfeld opted to re-create the modern airport for the label's Spring/Summer 2016 runway show in Paris yesterday (6 October). A space within the city's Grand Palais building was transformed into Terminal 2C, gate 5 of Paris-Cambon Airport, with key features including check-in areas and customer service desks, a large screen displaying flight times, and chairs typical of the airport environment. The label's own Chanel Airlines signage was evident throughout the space, accompanied by its iconic logo. Models, many of whom walked with luggage by their side, made their way along a traditional runway, followed by a circular route around the check-in area and desks in the centre of the room. Attendees were seated along the catwalk and in a circular structure spanning a large portion of the space. In a video interview with Rebecca Lowthorpe published on Chanel’s news page, Lagerfeld said: "Everybody is travelling today, [and] travelling conditions are not always the most pleasant thing in the modern world. "You have to make a proposition for all kinds of life, all kinds of style, and all kinds of ages – that is what Chanel is about you know – global dressing." He added that the collection includes a lot of silver as that’s the idea of aeroplanes – they are metallic and become very shiny when the sun is reflected on their surfaces. In keeping in line with the theme, guests received Chanel Airlines invites in the lead up to the show, which were similar in shape and size to a boarding pass.